Combine all the ingredients except the pork above into a small bowl. Rub the spice mixture onto the crown roast of pork and allow to sit for 30 minutes to absorb the flavors in a v-rack set into a deep roasting pan. Preheat oven to 350 degrees. Cover the exposed tips of the rib bones on the roast with foil to prevent burning. After the pork has absorbed flavors, place the roast into the preheated oven and roast for 3 hours or until the internal temperature of the roast reaches 175 degrees. Remove roast from oven and allow to rest for 20-30 minutes for juices to redistribute before cutting and serving. This roast was awesome! Great job on it! Yum! Wow!Very impressive. 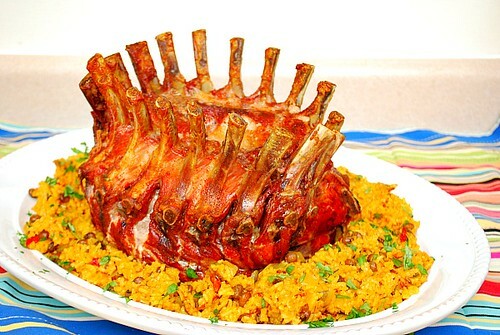 I wanna eat your Jamaican Jerk Crown Roast of Pork.I haven't tried eating that.It looks very delicious. I want to go there in Chicago just to taste that recipe. you like. Just remember anything that's created using flour is usually constructed with whole wheat. It posseses an impossible to resist sweet taste and flavour that make folks want for doing this. So it truly is natural to enable them to include dessert recipes like a main ingredient. As numerous breadmakers will bake the bread you only add sun and rain as directed in to the bread device set the timers and wait.